Adam R. Steigert"s S.T.A.R. [Space Traveling Alien Reject] (2016) now has an official movie trailer releases and here it is. This trailer is not your usual trailer so tell us what you think. This film looks like it will be a good stab at delivering something different. 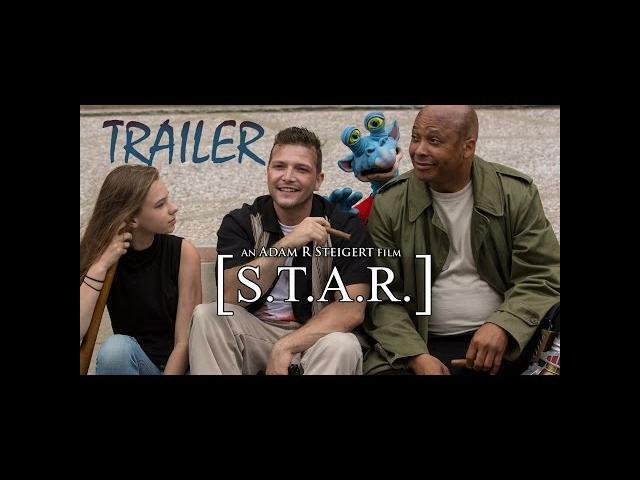 Nicola Fiore, Joe Fishel, and Sherri Lyn Litz star in S.T.A.R. [Space Traveling Alien Reject]. DefTone Pictures Studios Inc is about to take you on another exciting venture into indie filmmaking with their newest science fiction thriller! Over the past few years, DefTone Pictures Studios and Director Adam R Steigert have produced various titles such as the science fiction horror film Not Human (formerly Ombis: Alien Invasion) which is now available on DVD and VOD, the horror/comedy A Grim Becoming (currently screening in film festivals) and now the newest project: S.T.A.R. [Space Traveling Alien Reject]. S.T.A.R (Space Traveling Alien Reject) revolves around the once famous, award-winning writer Greg Vincent who is now a down on his luck, struggling alcoholic. Looking for inspiration for what he hopes will be his big comeback story, Greg ventures to the small town of Metsburgh. Along with revitalizing his career, he hopes that he can sell the story to get some much needed cash to pay off his debts to crime lord Angelia Branco. Enter STAR, an on-the-run alien fleeing certain death from the hideous Meroarks on his home planet of Mars. Greg encounters this blue, oddly shaped, wise-guy alien after they find themselves hiding in the same cabin. With a deadline given by the mob and an alien race hot on STAR"s trail, who will be able to save them? Will it be Alex Creed? The star of such grindhouse films as Devon Danger vs. the Atomic Space Zombies. Or maybe Marissa? A diehard fan of those very films. Could this be the basis for the perfect story which could jump start not only Greg"s career but also his life? DefTone Pictures Studios is aiming for a (2016) release of S.T.A.R. [Space Traveling Alien Reject]. Adam R Steigert will helm the project as Director. S.T.A.R reunites Not Human star Richard Satterwhite as Alex Creed and A Grim Becoming co-star Aryn Fitzgerald as Marissa with the DefTone crew. The film also features newcomer Christopher Barbis in the title role of Greg Vincent, Lori Cholewka as Lana, scream queen Nicola Fiore playing Sarah, supermodel Melyssa Jade as the villanous Angela Branco and Patrick Mallette voicing STAR himself. DefTone Pictures Studios" Not Human is currently available for purchase at Walmart stores nationwide and also online at amazon.com, Barnes & Noble, Best Buy, Fye and other major retailers. Rent or own it now on VOD (Video-on- Demand) through Verizon, Dish, Amazon Instant Video, ITunes, Vudu, Blockbuster, Shaw, Comcast plus many more platforms. Not Human"s DVD special features are a commentary track with Adam R Steigert and Makeup effects supervisor and graduate of the Tom Savini school of Arts (Douglas Academy) Phil Beith, Behind the Lens, Deleted Scenes, Making a Mutant, Photo Gallery and much, much more!